Daily Illuminator: See The Eris Of Your Ways? April 15, 2013: See The Eris Of Your Ways? What's more Discoridian than a Discoridian bible? 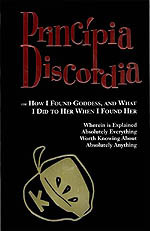 A Discordian bible that doesn't exist -- at least not in the physical realm. Where can one locate such an ephemeral tome that cannot be held in the corporeal realm? We humbly recommend e23 -- the home of much digital weirdness -- which recently tricked electrons into assuming the form of the Principia Discordia. This PDF edition of inciteful insight is perfectly suited for reading on your iPads, cellphones, toasters, or whatever else you've cajoled to display electronic texts. Plus those whom the Goddess has chosen might be able to purchase this volume for $5.23 -- an auspiciously illuminated price for such a wholly holy oddness spree.